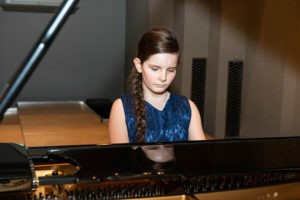 Emma Saskia Bähler, born in 2007, begins playing the piano before four years, and she gave her first official concert two years later playing mazurkas by Chopin and works by Brahms and with his mother Sibylle Bähler who is her first teacher. Emma Saskia Bähler has already performed in several Swiss cities: Basel, Bern, Fribourg, Avenches, Sigriswil, Zürich and Thun, playing as a soloist and with his mother of fourhands. She has playing also in Germany. Since 2017, she has been Alexandre Dubach’s partner several times, the great Swiss violinist from Thun. She has already won several first prizes, even with distinction. In June 2018 she won the first prize at the Steinway Piano Competition. At the end of February, beginning of March 2019, Emma Saskia Bähler gave for the first time concerts with orchestra. As in any etude, one particular technical aspect of the piano is explored. This Etude for piano explore the arpeggiated chords. The melody is sentimental and romantic. The harmony is diatonic at first but modulates into a different key. The harmonic development in here is very colorful, deep and emotionally intense. Following section brings back the opening melody that modulates to the original key. There is also a Coda that allows now the arpeggios to be played by the right hand while the melody is given to the left.